It is said that coaches golden days happened sometime in the 1950s. Back then, travelling by train was quite expensive, and travelling by coach was considerably less expensive; it was also much more flexible. For many people it was the coach that gave them their first taste of freedom, and it was the only way in which they could venture out of their own market town. As a result coach operators put on many new routes to popular holiday destinations such as Blackpool, Skegness, Brighton, and Margate. Many of those trips would include organised sing-songs of favourite tunes; various comfort breaks; and an obligatory brief stop at a pub, necessary for lubricating the vocal chords. Mystery tours were also very popular. On a mystery tour nobody knew where they were heading; they just got on the coach and expected to have fun, and often their expectations were exceeded. Really it didn’t matter where they ended up as the enjoyment was in the journey rather than the destination. Naturally certain destinations were also important and journeys were not restricted to England. Coach trips abroad became popular too, giving many people their first taste of venturing outside Britain, though many found it to be quite a cultural shock; all that foreign food and posh hotels. Also back then coaches were very different from those we know today. Certainly they were considerably less comfortable, but they also tended to be far more colourful. Every operator would have its own livery and it tended to be quite striking. 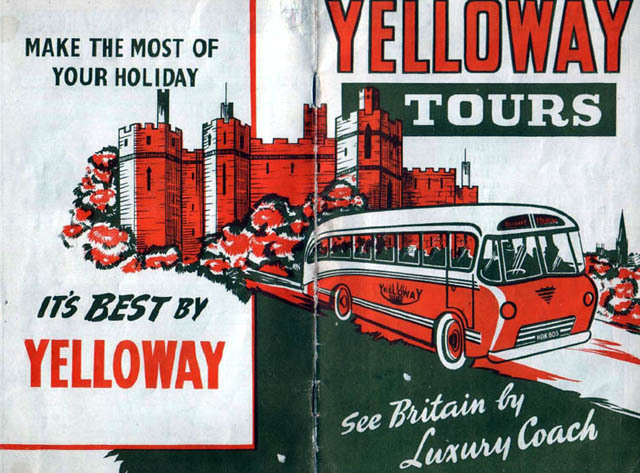 Many of the operators included alluded to the colour of their coaches in their brand names. The coaches of the South Down Coach Company were a beatific grass green colour; the coaches of East Kent were a vivid dark red; and Thames Valley coaches were a lighter shade of red. Coach stations were a veritable rainbow of colours which would disperse as the different operators set off in their different directions. Coach travel in the 1950s brought with it a new freedom that followed the austere times endured during the war and in the early years after it. It was the time following end of the boom in rail transport and preceding the availability of air transport for ordinary people. Coaches were really the People’s transport. Bus travel was fine for travelling locally, but coach travel provided a new dimension. Coaches would set off in convoys from grimy smog laden towns and cities and head for fresh pastures, bracing sea airs and foreign shores. This is a guest post by Claire Chat a new Londoner, travel passionate and animal lover. If you want Claire to write you specific content, you can find email her here or contact her on Twitter (Claire_Chat).